Here at SkyTruth, we are always looking for new ways to visualize the environmental impact of human activity, so we’ve been playing with LiDAR (Light Detection and Ranging) data and digital elevation models (DEMs). We thought it would be interesting, and potentially useful, to create a profile of the terrain of a mine before and after mining activity. I’ve started with the controversial Spruce No.1 mountaintop removal coal mine in Logan County, West Virginia as my test subject. Topography of the Spruce No.1 mine in Logan County, WV, in 2010. Google Earth imagery showed that significant mining activity had occurred between 2003 and 2011. I retrieved a digital elevation model (DEM) of the mine location that shows what the topography looked like in 2003, from the WV GIS Technical Center. 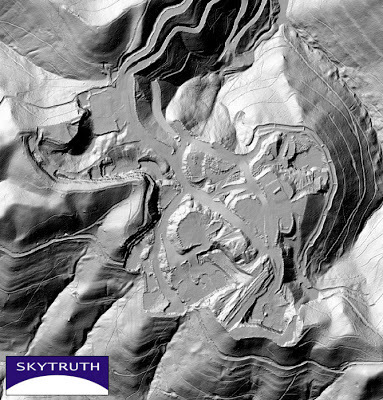 This elevation dataset was created from aerial survey photography that was flown in 2003. I then downloaded LiDAR data that was collected over the area in 2010 from WV View and converted the LiDAR to a DEM using ArcGIS. Next, I calculated the difference in elevation between the two DEMs; in other words, the change in elevation over that 7-year period. This is great technology. One thing to consider with this representation and the elevation profile created with before and after MTR. The reclamation will change the final grade to much different that what is pictured in this comparison. I would recommend looking at areas mined and reclaimed from 2003 to 2010 as those would show a true representation of permanent land form change. Thanks Billy. Some of the cut areas might get slightly modified – that's where the coal was removed – but the main thing that won't change is the valley fills, where overburden has been dumped into the adjacent stream valleys. That will be steeply graded and planted with vegetation to stabilize it, but the original valley topography will not be restored. I would like to translate this article to spanish for my students. Is it possible? You are free to publish a translation of our article with attribution. Please share a copy of your translation with us prior to publication. No, I could translate without problems from english, I don't like google translator, but I would like to translate your article to spanish language and I would like to use your pictures, of course, I must write that "you" are the authors, the link to your english article, etc. Do you have some legal restriccion or something like this? Could you give me your email for send the translation? Colorado – Operational Oil and Gas Wells Coal-Train Derailments and Record-High Temperatures. Related?